A male Cuvier's beaked whale passed away from emaciation and dehydration Saturday, March 16, just a day after it had washed ashore off the coast of the Philippines' Compostela Valley. 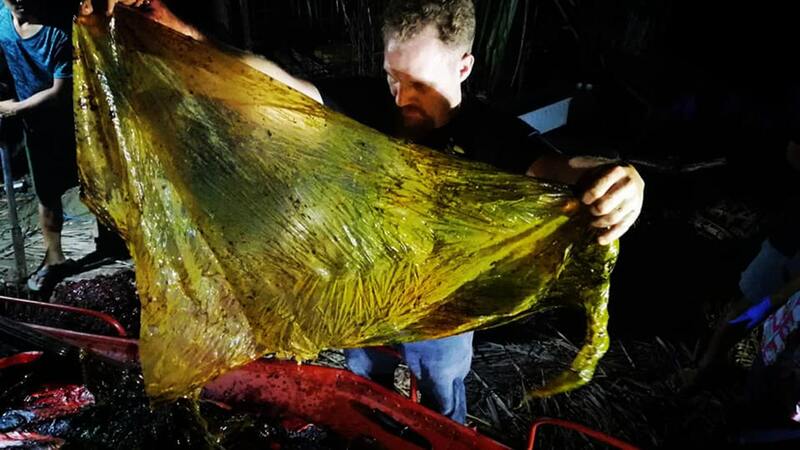 In yet another horrifying example of man-made factors wreaking havoc in the maritime ecosystem, a Cuvier beaked whale washed up dead at a Philippines beach recently and subsequent investigation revealed that it had 40 kilos of plastic bags inside its body. D'Bone Collector Museum published its update over the weekend, including multiple images of the whale's necropsy and the plastic contents of its stomach, on Facebook. The marine animal died of starvation due to its stomach being full of plastic waste, according to Darrell Blatchley, director of D' Bone Collector Museum Inc, who helped with conducting the examination. The materials were primarily composed of plastic bags, including shopping bags and rice sacks. Upon his arrival at the scene, Blatchley noticed that the whale showed signs of emaciation and dehydration. "This whale had the most plastic we have ever seen in a whale", they wrote in a Facebook post. Blatchley and his team work with BFAR and other organizations to assist in rescue and recovery of marine animals. Blatchley, who described the incident as "very disgusting and heartbreaking", called for stricter action against people making waterways and oceans their dumping ground. Darrel said workers would continue sifting through the whale's guts to identify the plastic which had clogged its stomach. The World Wildlife Fund has reported that the Philippines is one of the world's biggest plastic polluters, thanks to their dependence on single-use plastic. The result also stated squid beaks were recovered; the presence of parasites was observed in the whale's stomach and kidney. "At some point their stomach fills up with trash and they can't eat real food", Regina Asmutis-Silvia, the executive director of Whale and Dolphin Conservation, told National Geographic. Last June, a whale died in Thailand after swallowing more than 80 plastic bags, which weighed up to 8 kg.